Cresswind at PGA Village Verano is a 55+ community in Port St. Lucie, Florida. Residents here have access to a wide variety of amenities and lifestyle opportunities. They also have a collection of two to four bedroom home models to choose from. And living on Florida's Treasure Coast puts them in the middle of so many attractions, events, and outdoor recreation opportunities. Homebuyers looking for a standout 55+ community in Florida are sure to find lots to love about the resort-like amenities and well-designed homes of Cresswind at PGA Village Verano. As part of the PGA Village Verano master-planned community, residents will have access to a swath of exciting amenities and opportunities for fun. The 27,000 square-foot Club Talavera Social Clubhouse is the home base for residents looking for something to do and ways to enjoy the day. Amenities here include a ballroom, lounge, arts & crafts studio, card room, library, and demonstration kitchen. There's also a lifelong learning auditorium for speakers and furthering your education. In the Club Talavera Fitness Center, residents will be able to work out in the fitness center or yoga studio, do some laps in the indoor pool, or relax in the outdoor pool and sauna. There are also cabanas by the pool, a dog park for furry friends, and parks and natural space to enjoy the outdoors. A lifestyle director is available to help homeowners make the most of the impressive array of classes, clubs, community events, and celebrations. There is also a pickleball complex under construction that will be the largest in the region with 26 courts and championship court, outdoor pavilion, and event lawn. Exclusive to the residents of Cresswind is a pool and pool house that provides a chance for neighbors to mingle and relax together. Along with the pool and patio, there is also a tot lot for grandkids. The PGA Golf Club includes three championship courses designed by Pete Dye and Tom Fazio. It's also home to the PGA Center for Golf Learning and Performance, a 35-acre practice facility that is ranked among the top in the world, as well as the PGA Historical Center Museum. Membership at the club is available to residents at an additional cost. Plans at Cresswind at PGA Village Verano call for 249 single-family homes. There are four single-level floor plans that range in size from 1,571 to 2,576 square feet with two to four bedrooms, two to three-and-a-half bathrooms, and attached two-car garages. All plans are available with bonus rooms on an optional second floor. Modern, energy-efficient designs are complemented by thoughtfully designed outdoor living areas. First-floor master suites are common throughout all home models. Cresswind at PGA Village Verano is in Port St. Lucie, conveniently located on Florida's Treasure Coast. For day-to-day needs, there are two Walmart Supercenters and a Publix very close by. There are also multiple restaurants and retail stores nearby for residents to enjoy. Along with the golf courses located inside the community, residents will find multiple golf courses located in the immediate region as well. Baseball fans will appreciate the close proximity to First Data Field, spring training home of the New York Mets as well as the home of the St. Lucie Mets minor league team. The nearby AMC Port St Lucie multiplex and Superplay USA provide fun nighttime entertainment and options for grandkids. And of course, the community is minutes to North Fork Saint Lucie River Aquatic Preserve, Savannas Preserve State Park, and sprawling Atlantic Ocean beaches. The community is located around the corner from I-95, which gives residents very easy access to everything Florida has to offer. By car, the community is 40 minutes from Vero Beach, two hours to Orlando and Miami, and two-and-a-half hours to Tampa and Daytona Beach. It's also very close to West Palm Beach International Airport and Vero Beach Municipal Airport. Social Clubhouse - 27,000 Sq. Ft. 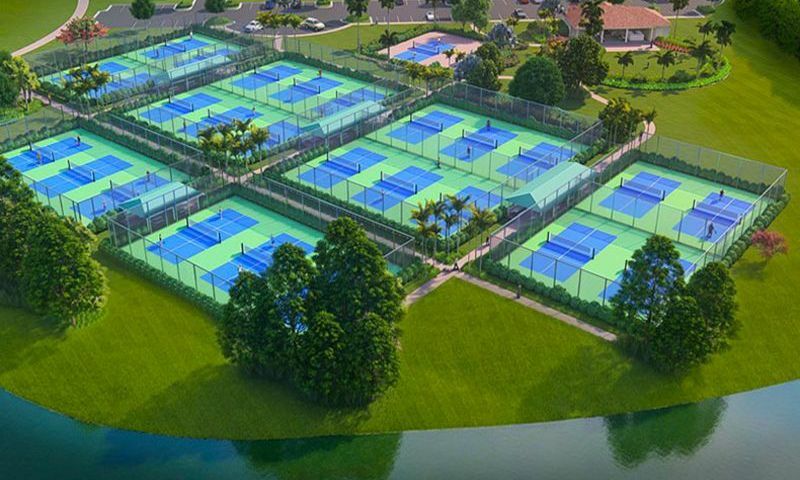 The largest pickleball park in South Florida - COMING SOON! A smaller, neighborhood amenity center is also available to residents of Cresswind at PGA Village. Check back soon for more information on the lifestyle in Cresswind at PGA Village Verano. There are four floor plans that range in size from 1,571 to 2,576 square feet with two to four bedrooms, two to three-and-a-half bathrooms, and attached 2-car garages. All plans are available with bonus rooms on an optional second floor. 55places.com is not affiliated with the developer(s) or homeowners association of Cresswind at PGA Village Verano. The information you submit is distributed to a 55places.com Partner Agent, who is a licensed real estate agent. The information regarding Cresswind at PGA Village Verano has not been verified or approved by the developer or homeowners association. Please verify all information prior to purchasing. 55places.com is not responsible for any errors regarding the information displayed on this website.